When a baby comes into your life, it is—happily—all-consuming. You fall in love with this little creature at first glance, and you give him all your patience, love, and all the precious, precious hours you used to sleep. Your world is a constant cycle of eating, sleeping, changing, bathing (the baby, not you — not you by a long shot), and once the newness wears off, well…there’s a reason why they call those early months “baby jail.” Babies have a lot of needs, and it’s often easier to stay tethered to home base than to drag the little one and all their necessities into the outside world, only to have a disastrous diaper situation make you regret the whole thing. The ironic thing, however, is that the only way to forge through the fear of bringing baby into the outside world is to take a deep breath, pack extra wet wipes, and cast aside your parental hermitage. You’ll be more fulfilled, you’ll make memories, and your baby…well, your baby won’t really care as long as you bring snacks. So if you were glued to the trail before junior came along, take heart! Today’s manufacturers have all the gear you’ll need to bring baby along for an outdoor adventure without inviting disaster, and one of the most essential pieces to own is a solid hiking stroller. New parents are used to consulting checklists when it comes to purchasing everything they need for their little one, so let’s make this easy on those sleep-deprived eyes. 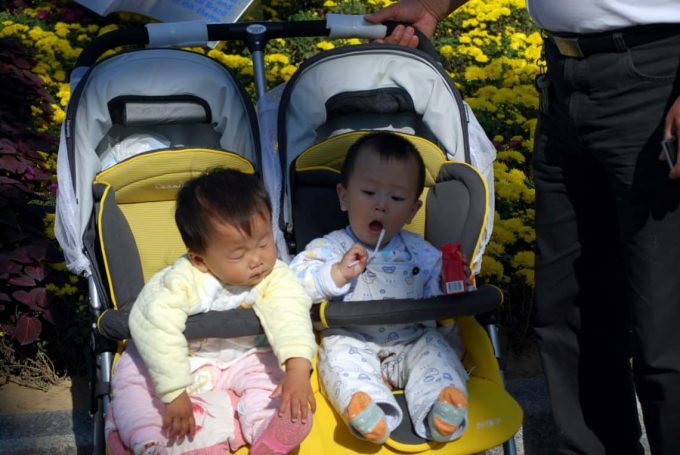 Here is a comprehensive list of what you’ll want to consider before buying a hiking stroller. 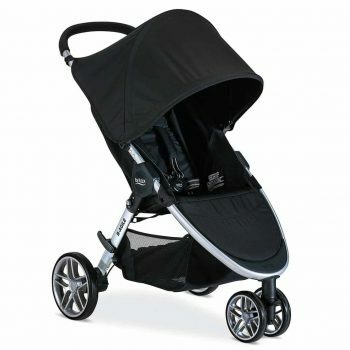 Pneumatic (or air-filled) tires are essential when it comes to purchasing a stroller that will need to cross rough terrain while keeping baby comfortable. A good hiking stroller will have large, pneumatic tires to absorb shock, pass over obstacles with ease, and allow for minimal rolling resistance. You’ll need to check the tires regularly to ensure that they are inflated properly, and it’s a good idea to bring your air pump along. Be sure to check the stroller manual for inflation guidelines. Just as cars need suspension systems to absorb shock and motion and provide a smoother ride, a good hiking stroller requires the same set-up. Kids love to be gently swung and bobbed and rocked, but no one likes to be wildly jostled around over an uneven trail. Many hiking strollers offer adjustable suspension, which can be altered to suit the condition of the trail and the weight of your little one. 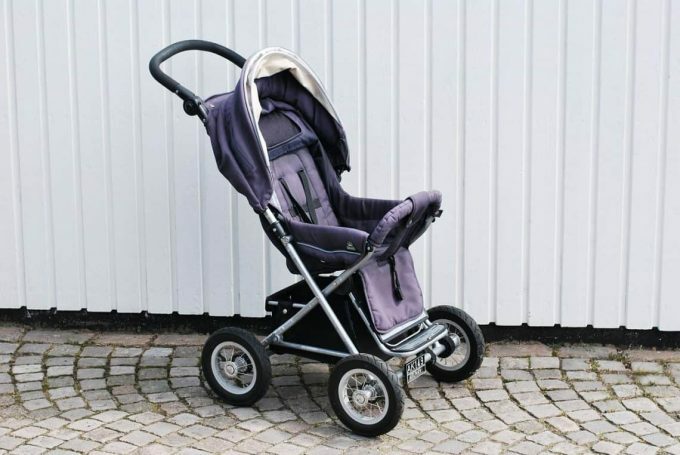 Not to be confused with wheel locks, which can be taken on and off and keep the stroller still while you’re stopped, a fixed or lockable front wheel allows the wheel to roll, but prevents it from turning. Exactly what it sounds like. Parking brake will help you to securely park your stroller. No one wants a runaway stroller on the trail. Not unlike the harness system employed in most car seats, a stable five-point harness is essential to keeping your child safe during your hike and in the event of an accident. 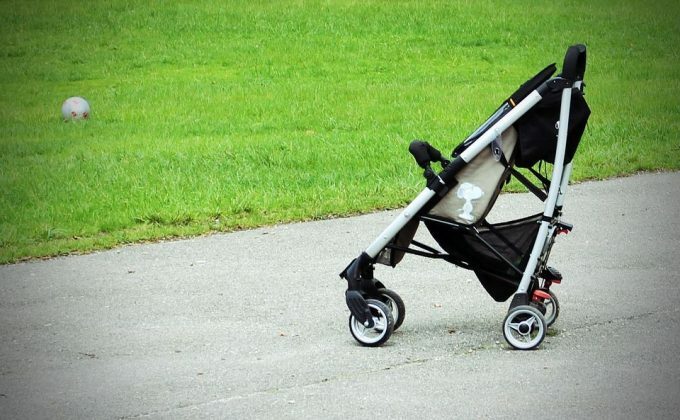 Even the most attentive parents get distracted, and there might be an instance in which you accidentally lose your grip on the stroller handle. A safety tether connects your stroller to your wrist, ensuring that you will always remain in control, even if you momentarily let go of the handle. A large, sturdy canopy is essential from protecting that pristine baby skin from the elements. Bonus points if the canopy can be adjusted to multiple positions for optimal coverage no matter the conditions or time of day. Some canopies also have windows that allow you to keep an eye on your little one from your vantage point behind the wheel. Small children are often lulled to sleep by motion, and riding in a hiking stroller (that has pneumatic wheels and a good suspension system for a smooth ride) will likely incur a nap time or two. Make sure the stroller you choose has a seat that can recline to multiple angles to facilitate your sleepy adventurer. Remember those extra wet wipes we mentioned earlier? Well, they need to go somewhere. 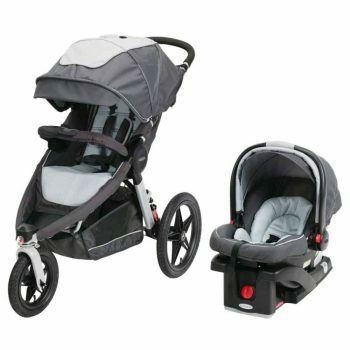 Well-designed hiking strollers will have ample under-seat storage for diaper bags and other accessories. It’s essential to be able to stow items under the seat; looping bags or other gear on the handlebar will throw off the balance of your stroller, making it prone to tipping over. A cup holder or two is also a nice feature for holding a water bottle or sippy cup, but hot beverages are a no-no. In the event of a tumble, a hot beverage could spill and seriously injure your child. Hiking strollers are not the most compact of beasts, but many can be folded into a more manageable size for ease of transport—especially if you’ll be checking them as baggage at the airport. A good hiking stroller will have removable wheels for this purpose as well. For extra peace of mind, look for a hiking stroller that has been certified by the Juvenile Products Manufacturers Association (JPMA) according to the standards of the American Society for Testing and Materials (ASTM). While it’s understandable that you might be anxious to bring your baby along with you on the trail, it is absolutely essential that your baby have strong enough neck and core muscles before you subject them to the less-than-smooth experience of riding in a hiking stroller. Adequate neck and core strength usually doesn’t show up until around eight months of age, and even then, some experts recommend holding off until baby’s first birthday. Check with your pediatrician before your first trip to get customized, professional advice on your baby’s development and to seek the official thumbs-up. Now that we’re all up to speed on hiking stroller basics, let’s take a look at some of the most popular makes and models available today! The BOB Revolution PRO Stroller is a customer favorite when it comes to all-terrain strollers with state-of-the-art safety features. It offers an adjustable suspension system for customized support, reclining seat with one-hand control, and an adjustable, padded handlebar to perfectly accommodate the height of any parent courtesy of nine possible positions. A lockable front wheel can be left free to swivel on a particularly twisty path, and the hand-activated, rear drum brakes ensure you are always in control even when descending steep hills. Extra-large under-seat storage also means you can stow all the necessities and then some. This stroller can also be combined with a compatible infant car seat to accommodate tinier travelers, and it can be easily folded in two steps at the end of a busy day on the trail. 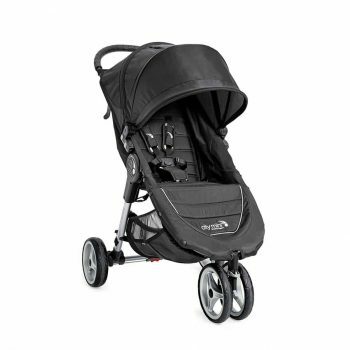 The manufacturer recommends this stroller for children from 8 weeks old and up to 75 pounds. Parents should always be prepared for anything…even if that anything is more children. The Baby Jogger City Single Stroller is here to keep you moving forward even when another little one enters the fold. This customizable stroller can accommodate one child or be converted into 16 different combinations to become a double stroller with car seats, bassinets, or car seat adapters. These adjustments can configure the stroller to front-facing, parent-facing, or even sibling-facing, depending on your daily needs. Baby Jogger’s quick fold technology allows you to collapse the stroller in one easy step (which might be the easiest child-related task you accomplish all day). The seat offers multiple recline positions with a weight limit of 45 pounds per seat, and also boasts a multi-position footwell. The large UV 50+ canopy has a peek-a-boo window with a magnetic closure so you can keep a watchful eye on your little one while enjoying the sights on the trail. The Graco Relay Jogger Stroller has all the durable basics you need to tackle any kind of train with your little traveler. This stroller includes the high-quality Snug Ride Click Connect 35 Infant Car Seat, making it possible to bring the wee one along on your adventures while keeping her snug in her seat. 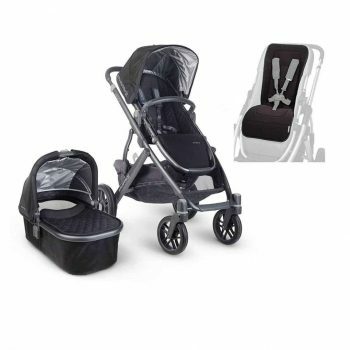 The infant car seat clicks into the stroller with one easy-but-secure step, and the pneumatic tires, premium suspension system, and locking front-swivel wheel give you ultimate control and shock absorption. The reflective, performance-grade fabrics help to provide visibility in low light, and the generous UV 50 canopy protects your child from the elements. Parents report that this sturdy stroller really delivers with its performance on the trail, and is an equally excellent choice for every day adventures and errands in less challenging environments. Consumers also say the under-seat storage isn’t as roomy as on other strollers, but that this smaller storage space contributes to the overall aerodynamic design of the product. The UPPAbaby Vista Stroller is a wise investment for parents who are looking to grow their active family without depleting their wallet with single-ride stroller purchases. This stroller can easily accommodate up to three children with configurations that can hold two car seats, two bassinets, or 2 toddler seats—with extras available to allow for rear or forward facing seats and the PiggyBack Ride-Along board for adding little adventurer #3. The intuitive design of this stroller allows it to fold up easily for convenient transport, and it comes with a seat liner to guard against those inevitable messy snack time spills and other…unfortunate accidents. What’s more is that this stroller boasts machine washable polyester fabric, to ensure a clean and comfortable ride for your kids, no matter what happened during the last adventure. While this stroller is not built to take on the most advanced trails, it’s a safe and convenient choice for parents of multiples with a taste for adventure. The Britax B-Agile Stroller boasts a lightweight aluminum frame that folds in seconds and can be carried with ease, making it the perfect choice on those days when your little one might be in and out of the stroller multiple times, forcing you to go from pushing duties to pack mule patrol and back again. 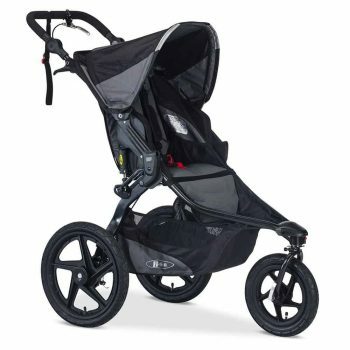 Swivel front wheels mean this stroller is great at maneuvering through tight spaces and large crowds, but it’s not what you’ll need for a high-powered jog on the trail. Any Britax infant car seat will snap easily and securely thanks to the signature Click & Go System, and roomy under-seat storage provides ample storage for essentials…along with an extra zippered pocket for all those other essentials. Even if you don’t have a Britax car seat, the purchase of an additional adapter will allow other brands of infant seat compatible with this best-selling stroller frame. The Baby Jogger City Mini Stroller is not the stroller you want for trail runs or challenging hikes, but it is the perfect vehicle for tackling the urban wilderness of museums, zoos, theme parks, or sidewalk sight-seeing. A lightweight and easily folded in one step thanks to patented quick-fold technology, this stroller travels easily in your trunk or the cargo hold, but don’t let it’s nimble design fool you: this stroller’s reclining seat can hold kiddos up to 50 pounds. The UB 50+ sun canopy has two peak-a-boo windows for optimal peek-a-booing, and it can be adjusted to accommodate the ever-increasing head height of your little (but always getting bigger) one. 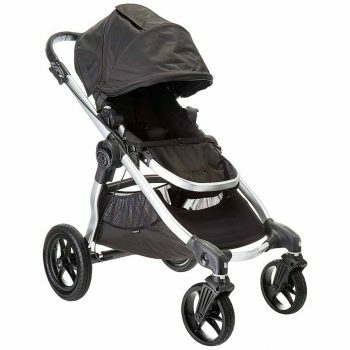 This stroller features three wheels with 8-inch EVA tire tread, and has a lockable swivel front wheel and sturdy front wheel suspension. Kids grow and change at lightning speed, but those first few years can be quite a shock to the system for new parents. Ease the transition into parenthood by combining your love of outdoor activities with your love of your new (and possibly expanding) family. Today’s hiking strollers can give you the high performance you want and the security and support your child needs to make your days in the wilderness the bonding experience you’ve always dreamed of. Do you have a hiking stroller you love? Or some advice for new parents taking their little ones on the trail for the first time? Share your advice or questions in the comments!